If you'd like discreet protection to help you stay dry on the lighter days of your period or at any time, try fresh pantiliners. 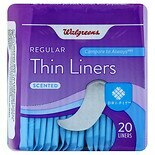 You can use these pantiliners with a subtle, clean scent when a maxi pad or tampon isn't necessary. You can choose from different lengths, shapes and absorbencies of fresh pantiliners, and there are even pantiliners with wings to help them stay in place. 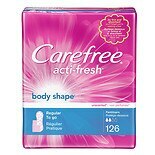 With a selection from brands such as Always and Carefree, Walgreens.com can help you stay comfortably dry and fresh. 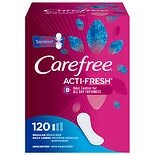 In addition to fresh pantiliners, you'll find a broad selection of hygienic feminine care products including maxi pads and tampons. 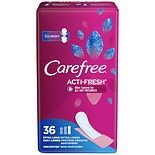 You can find scented and unscented tampons, as well as fresh scent and unscented maxi pads with varying levels of protection in different sizes. Don't forget the PMS pain relief remedies and heat therapy products to help with cramps. 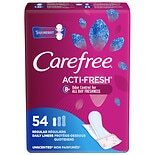 You'll also find feminine hygiene washes and yeast infection treatments for your other feminine needs.